We give to you, dear God, with open hands today – knowing that your generous hands are opened to us day, by day, by day. Take our gifts and let them work for the good of those you love, those who need these offerings most. Today we pray with special awareness for the role of doubt and fear in our lives and the lives of others. We pray for those whose doubts and fears are of abuse or violence. Grant them protection of body and assurance of spirit. We pray for those whose doubts and fears are for an uncertain future or an unwanted outcome. Give them peace in waiting, and calm in relinquishing their worry for what they cannot control or direct. We pray for those whose doubts and fears are for friends and loved ones. Teach them how to express their concern, their hope, and their support, while trusting that those they love are ultimately always in your wise care. And God, we pray for our own doubts and fears… those worries that wake us at night or trouble us at dawn… those things that sap our energies and take us on a detour from the path toward you we might otherwise walk with bold conviction and grace. Teach us how to acknowledge our hesitancies and doubts without letting them master us. 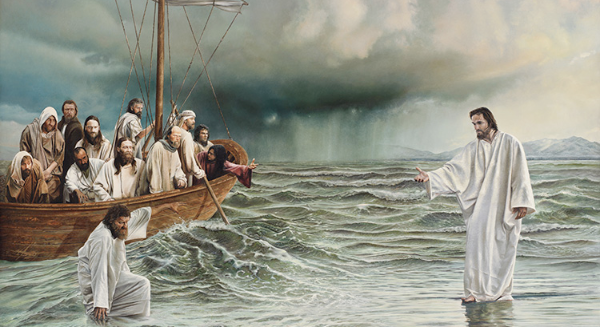 Let the vision of Jesus’ walk on the water toward the buffeted boat be for us a vision of eternal reassurance. When we are storm-tossed and afraid, let us see you with us, coming to us through the turmoil. And let us, whenever we are fearful, recall the words of Christ: “Take heart, it is I; do not be afraid.” Let these words echo in our hearts and minds, let them sound above the roar of the storm, and let them nudge us to reach out for support to you, to walk with and toward you. And with renewed strength, may we also reach out to others who are yet caught in the storm. We are grateful for every way you come to us, God, and we are especially grateful for your Son, Jesus Christ, whose life, death, and resurrection provides us with confidence, whatever befalls us. Christ has overcome all. We may live with bold assurance that all shall be well. In Christ’s memory we pray, using now his very words… The Lord’s Prayer… Amen.